What does a cross-training day look like during marathon training? So far I've talked about what a rest day looks like for me during this marathon training cycle and also my pre and post long run routine looks like. Today I wanted to give you a peek inside what a cross-training day looks like for me. For me, my cross-training day is on a Monday so I start out my week with it! I recently switched out my cross-training from just doing strength training (either weights or bodyweight workouts) and the elliptical to switching out the elliptical for a spin class. This makes it a longer day but I’m loving the change! But we’ve got a while to go in my day before we get to my workout. Like on my rest day, I start my day at 4:30 a.m. Luckily I’ve been sleeping through the night without waking up (probably because I’m coming down with a cold and have been taking cold medicine at night) and I wake up feeling so refreshed. It’s a pretty packed 2 hours but I’m so used to it that it doesn’t feel that busy! Onto work! Usually Mondays are pretty easy at work but once a month I have meetings in the morning. And of course it was today. So I spent over two hours in meetings and ate lunch at my desk while I worked a little bit more. I know it probably isn’t the best to eat at my desk but there’s isn’t really a “lunch area” in my building and eating while doing some work frees up break time for something else. Today, that something else was getting in a walk and also doing some work on the blog. Sometimes I’ll use my lunch break to knit (and once it’s nicer I can sit outside and knit) but since I was going to spin class I wanted to make sure I still hit my step goal. I work in a pretty residential area so it’s easy to get out for a walk. 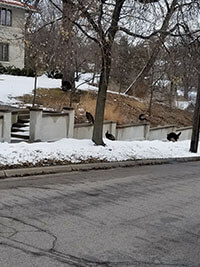 Of course, now I have to be aware because the turkeys are out and about and they have no fear of humans. Once I got back to work, I finished up what I wanted to do for the day (and had a pre-workout RX bar) and then headed out to the gym at 4 p.m. I haven’t gone to LA Fitness in forever on a Monday after work so I wasn’t sure how busy the weights area would be. Luckily, it wasn’t too packed so I was able to find a spot to do my strength training workout. All the 15 lb weights were taken so I ended up grabbing 10 and 20 lbs instead. I did a brand new workout on the NTC app called Wipeout 2.0. It was tough and got my heart rate up (next time I’ll wear my heart rate monitor). I was sweating pretty good by the end so I was glad i had some time to cool down on the elliptical before spin class. One thing I really like about this spin class is that it’s not super high intensity class like some other ones I have taken. So it’s the perfect addition to my cross-training because it’s a way to mix up my cardio without wearing myself out too much. Of course, I haven’t been trying too hard to get my heart rate up during class since I’m doing so much running and want to use it as a lower-intensity activity. Still, Ibetween weights and spin class I was happy to have some Nuun on hand to hydrate! I finally got home at 7 p.m.to a very happy Vinnie. Mike is done with bowling so he took care of Vinnie so I could take the spin class but I got pounced on when I opened the door. I made a tropical fruit protein smoothie for dinner (it was so late that I didn’t feel like eating much but I knew I had to get something in) and got ready for bed. 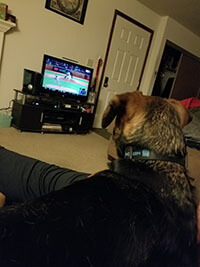 I was going to work on the blog some more but when I sat down I was so tired that I decided to knit and watch the Twins game with Mike instead. Vinnie and I ended up going to bed at 9 p.m. while Mike watched more of the game. I put on a podcast to fall asleep too (Stuff You Missed in History Class Saturday re-run) and Mike apparently came in before the sleep timer was done. I don't even remember him coming in but apparently I was grumpy about him taking up space in my bed.